The Pacific Northwest has the diverse feedstocks, infrastructure and political will needed to create a viable biofuels industry capable of reducing greenhouse gases and meeting the future fuel demands of the aviation industry. Creating an aviation biofuels industry, however, will depend upon securing early government policy support to prioritize the aviation industry as a beneficiary of US biofuel development. That’s the conclusion of a 10-month study by Sustainable Aviation Fuels Northwest (SAFN), the nation’s first regional stakeholder effort to explore the feasibility, challenges and opportunities for creating an aviation biofuels industry in the Pacific Northwest. Boeing and Alaska Airlines partnered with Portland International Airport, Seattle-Tacoma International Airport, Spokane International Airport and Washington State University in a strategic initiative to identify the potential pathways and actions necessary to make safe, sustainable aviation biofuel commercially available to airline operators in the area. Learn more about the study at www.safnw.com. Sustainable-investment-guide.com, a UK information website about green and ethical investments, released an article today on the consequences of the new FIT rates, which are expected to take effect as of April 2012. The article comes in response to the recent announcement by the Department of Energy and Climate Change (DECC), which confirmed much-speculated on plans to slash in half the existing FIT incentives for small-scale solar photovoltaic (PV) installations in the country. The article claims that all PV installations, which are currently under construction, must be registered in the Ofgem system by December 12, 2011 if they are to take advantage of the existing higher FIT rates. As of April 2012, new lower rates will be imposed on all projects approved after the cut-off December deadline. Sustainable-investment-guide.com further explains that current FIT rates are set at 43.3p per kWh and are paid for 25 years after the initial PV installation, giving investors about 7 per cent return on their investment. Under the new policy, these rates will drop to 21p per kWh, resulting in approximately 4 per cent return on investment. Therefore, the website states, after April 2012, a solar installation, which cost around £10,000-£12,000 to build, will take almost double the time to be paid off. Instead of 10 years, investors can expect to be in credit for 18 years. The article claims that the government’s hasty decision can create a ripple effect, scaring away investors in other industries as well. In the context of the larger Euro crisis, this instability could discourage entrepreneurship, contracting the job market and affecting the economic stability in the country, the website says. Sustainable-investment-guide.com also notes that investor reluctance to put further funds into the renewable energy sector and develop zero or low-emission, cost-effective technologies could bear larger energy and environmental consequences for the country and its environmental goals. The portal cites a report by the International Energy Agency (IEA) to illustrate how the government’s new energy policy translates in the broader energy picture. The IEA 2011 World Energy Outlook estimates that global energy-related greenhouse gas emissions have spiked by 5.3 per cent in 2010 to a record 30.4 gigatonnes (Gt). Echoing the IEA recommendation, the article warns that governments will have to take urgent and consistent policy action to avert catastrophic climate changes and “viciously more expensive” energy in the future. By 2035, the website explains, emissions will reach 36.4 Gt, leading to global temperature increase of more than 3.5°C. To read the full article and to get more information about the sustainable investment market, visit http://www.sustainable-investment-guide.com/new-feed-in-tariff-rates-industry-in-havoc.php. The Botanical Research Institute of Texas is accepting nominations for its 2012 International Award of Excellence in Sustainable Winegrowing. The completed submission (application and wine sample) is due on or before March 31, 2012. The award will be presented at BRIT’s annual fundraiser, Fête du Vin Wine Dinner and Auction on Saturday, October 6, 2012, in Fort Worth. Guests at the black-tie affair will raise a glass of the winemaker’s sustainably grown wine in a special salute, while enjoying a festive evening featuring haute cuisine and spectacular silent and live auctions. Proceeds from the fundraiser will benefit BRIT and advance its mission to conserve our natural heritage and achieve public understanding of the value that plants bring to our lives. Nominees are required to provide an assessment of their organization’s accomplishments in sustainable winegrowing, winemaking, and social responsibility practices. They must describe their organization’s conservation efforts in the vineyard and in operations: how waste is avoided, how it is reclaimed, and how the winery extends conservation efforts to its customers. They must also detail the practices they have established to maintain environmentally sound, socially responsible, and economically feasible winemaking principles. A bottle of wine must be provided for a tasting by the judging committee. Because BRIT does not have an alcohol importing license, BRIT requires that all international submissions be made through the winery’s US importer/distributor. Among the 18 criteria to be judged are seed selection, agricultural and winemaking protocols for saving water, soil conservation, saving energy, packaging protocols for waste reduction, programs for reducing carbon (CO2 e) emissions, social responsibility programs, and plans for continual improvement. For 2011, Parducci Wine Cellars received BRIT’s International Award of Excellence in Sustainable Winegrowing based on its advanced sustainability standards and accomplishments. Parducci Wine Cellars is recognized as America’s greenest winery. In 2010 the award went to Hall Wines of California. 2012 Sustainable Winegrowing applications may be downloaded from the BRIT web site at http://www.brit.org. Founded in 1987, the Botanical Research Institute of Texas (BRIT) based in Fort Worth, Texas, is an international, scientific research and learning center focused on conservation, knowledge sharing, and studying the diversity of plant life. BRIT conducts extensive global research, including major projects in Texas, Europe, Peru, and the Pacific Islands. In the last 10 years, BRIT scientists have located and described scores of species previously unknown to science. BRIT’s herbarium is among the largest in the United States and is the largest U.S. herbarium not part of a university, botanical garden, or broader natural history museum. In the spring of 2011, BRIT moved into its new, US Green Building Council LEED (Leadership in Energy and Environmental Design) Platinum-certified headquarters located in the Fort Worth Cultural District. For more information, visit http://www.brit.org. Mary Robinson, the first woman President of Ireland (1990-1997) and former United Nations High Commissioner for Human Rights (1997-2002), has spent most of her life as a human rights advocate. The recipient of numerous honours and awards throughout the world, Mary Robinson is a member of the Elders, co-founder and former Chair of the Council of Women World Leaders and Vice President of the Club of Madrid. She is chair of the GAVI Alliance Board. She chairs the Fund for Global Human Rights and is Honorary President of Oxfam International, and Patron of the International Community of Women Living with AIDS (ICW). She is President of the International Commission of Jurists. She is now serving as President of the Mary Robinson Foundation – Climate Justice. Skunkfunk’s Fall / Winter 2011 Collection, “Fight the Grey,” features a broad range of styles for men and women. Environmental and social responsibilities are always in fashion at New York and San Francisco clothing store Skunkfunk. This year, the fashion-forward retailer of organic cotton, recycled polyester and Lyocell attire is making shopping fun and rewarding with a special sale on Black Friday and all weekend long at their three retail locations. A fishbowl at the register will be filled with discounts of up to half-off the total purchase amount, and Skunkfunk shoppers will get to play the exciting pick-your-own-discount Go Fish game. Savings don’t end on Black Friday. Saturday and Sunday, November 26 and 27, all merchandise will be marked down 30%. The doors at the San Francisco men’s clothing and women’s clothing store open at 10 am, and New York doors open at 11:30 am. Skunkfunk’s Fall / Winter 2011 Collection, “Fight the Grey,” features a broad range of styles for men and women and includes dresses, jackets, coats, sweaters, skirts, tops, t-shirts, bags, wallets, scarves, hats and gloves. The complete collection is available exclusively at Skunkfunk’s retails stores in Manhattan and San Francisco. Skunkfunk works hard to bring positive change to three areas of their fashion industry: people, planet and prosperity. Textiles are carefully chosen based upon their impact to the environment, and include recycled polyester, organic cotton, and Lyocell. Polyester comes from crude oil, a natural scarce resource with a low renewability ratio. Recycled polyester is processed in a less energy intensive way than creating virgin fibers, and it’s a perfect option to give a second life to post-industrial remains or post-consumer plastic waste. Organic Cotton is a natural fiber cultivated without the use of synthetic chemicals, such as pesticides or fertilizers, and is not genetically modified. Lyocell is a light and silky textile made from regenerated cellulosic fiber that comes from eucalyptus wood pulp. The biodegradable fiber is extracted under a sustainable closed-loop process that saves energy. For more information about Black Friday, holiday shopping, or any of Skunkfunk’s products, call (415) 692-7678, go to http://www.shopskunkfunk.com, or visit one of their three stores located at 1475 Haight Street (Haight-Ashbury) and 302 Valencia Street (The Mission) in San Francisco or 181 Orchard Street (SoHo) in New York City. Skunkfunk is a Spanish-born New York and San Francisco clothing store that specializes in environmentally-friendly women’s, children’s and men’s clothing. Skunkfunk has stores in San Francisco, New York City, various European cities and online. Their clothing is also sold in multi-brand stores throughout the United States. We all lust for iPhones, iPads, and the like, and yearn for the day the developing world can use the same cool gadgets we geek on. 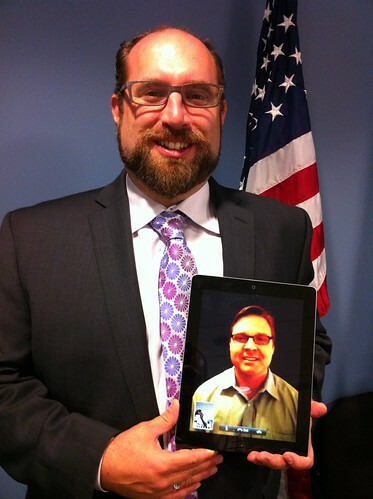 But did you realize that iPads could be used in remote areas today? That rural coffee farmers in Mexico, Peru, and Tanzania are enriching themselves and their communities through an enterprise iPad app. At the September Technology Salon, we heard from Corey Pressman of Experimamedia and David Griswold of Sustainable Harvest on how they developed iPad apps to help coffee growers become more efficient, reliable, and quality-focused. You can read about the event here: iPads in Agriculture: Glitz Toys or ICT4Ag Business Tool? At this Salon, we decided to eat our own dog food and had David join us via FaceTime on the iPad. He was a great participant via tablet until network congestion took him offline about 3/4 the way through the session, or about 9:30am, when the DC office of UNF was fully staffed and everyone started using bandwidth. Overall, it was a successful virtual+in-person Salon mix. A view of the Middelgruden offshore wind farm. 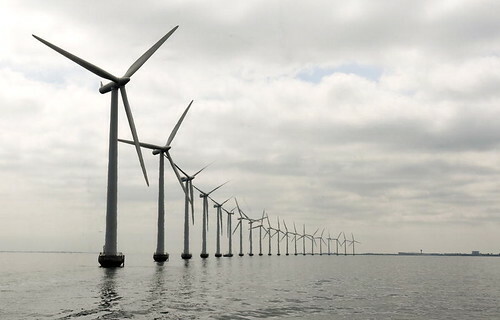 The wind farm was developed off the Danish coast in 2000 and consists of 20 turbines. 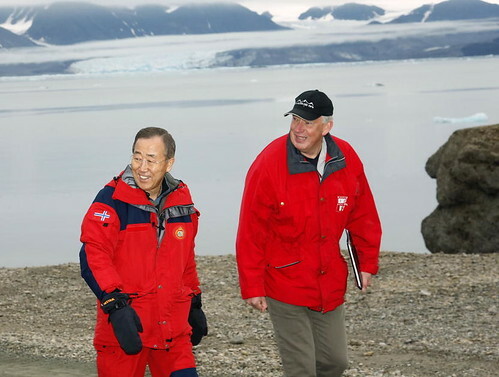 Secretary-General Ban Ki-moon (left) with Oddvar Midtkandal, Director of the Kings Bays Research Center, in Ny-Alesund, Norway. Witnessing the impacts of climate change firsthand, the Secretary-General appealed to the world to "seal the deal" in Copenhagen in December, a deal which will be comprehensive, equitable and balanced, so that both industrialized and developing countries and all citizens of the world can live in an environmentally sustainable way. Principor Communications today announced it will continue to represent International Relief & Development (IRD) to assist with message development and media outreach. IRD is a leading global humanitarian organization that helps vulnerable people stabilize their communities and achieve self-sufficiency. Founded and led by Dr. Arthur B. Keys, Jr., IRD focuses on development programs in conflict and post-conflict environments. Successful projects have been and are being implemented in Afghanistan, the West Bank, Cambodia, Zimbabwe, Ukraine and many other countries. Principor will continue to focus on obtaining media coverage that highlights IRD’s programmatic successes and communicates the value of development work in promoting global values and international peace and stability. In addition to IRD, Principor has designed and implemented communications campaigns for The KonTerra Group, Disability Management Employer Coalition, Insurance Educational Association, Fidelis Security Systems and many other profit and not-for-profit organizations. Principor Communications is a public relations consultancy based in Washington, DC that specializes in serving growth-oriented enterprises. Principor’s team offers senior level experience, strategic insight and creative execution to help clients ‘Master the Message to Master the Market.’ Telephone: 202-595-9008. Web: http://www.principor.com.